Physical characteristics: These loons measure anywhere from 20.8 to 27 inches (53 to 69 centimeters) in length and are the smallest of the loon family. In summer, the red-throated loon's head is gray, the neck is striped, and there is a bright red patch at the front of its neck. In winter, the head and neck are gray on top with a white underside. The bill is black, and the belly is white. The loon's back is always black. 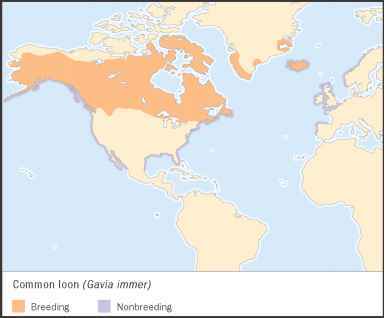 Geographic range: Red-throated loons summer in the tundra and along arctic coastlines. Winters are spent in the Great Lakes region and along the northern coasts of the Atlantic and Pacific Oceans. The birds are also found in the Caspian, Black, and Mediterranean Seas. 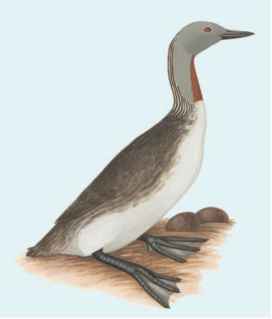 Habitat: The red-throated loon is seldom seen far from saltwater. It can be found in estuary (combination of salt water and fresh water) waters at the mouths of rivers. Breeding takes place in freshwater lakes and ponds. 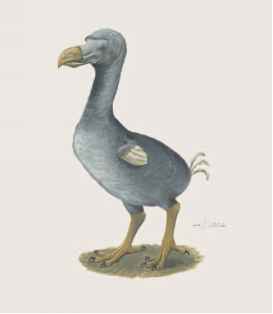 Diet: These birds eat medium-sized fish, preferring marine (salt water) fish to freshwater food. Behavior and reproduction: This is the only loon that can take off for flight from land because it doesn't require a running start from water. It is also the only loon species to vocalize in pairs, as mated couples do on breeding ponds. The call is a long, low-pitched whistle with individual notes interspersed, and both mates call at the same time. Although the male chooses the nest site, both parents build the nest from plant matter. Nests are made close to the water's edge because loons have difficulty walking on land. Mating, however, takes place on land. Breeding occurs May through September, and incubation lasts twenty-four to twenty-seven days. Two eggs are usually laid and incubation begins immediately. This means that the first egg is larger, so the first chick is usually the healthier of the two. When food is scarce, the second-born chicks often starve to death. Red-throated chicks are ready to breed between two and three years of age, and they have been known to live twenty-three years in the wild. Red-throated loons and people: Inuit legally hunt around 4,600 loons of all species each year for food and skin. Red-throated loon skin is often used to make ceremonial dresses.